Just the other day, we brought you news that Ford is readying an entry-level, performance-oriented variant of the Mustang. Rumored to be called Mustang SVO, the vehicle could make its debut at the 2019 New York International Auto Show that starts in just two weeks. 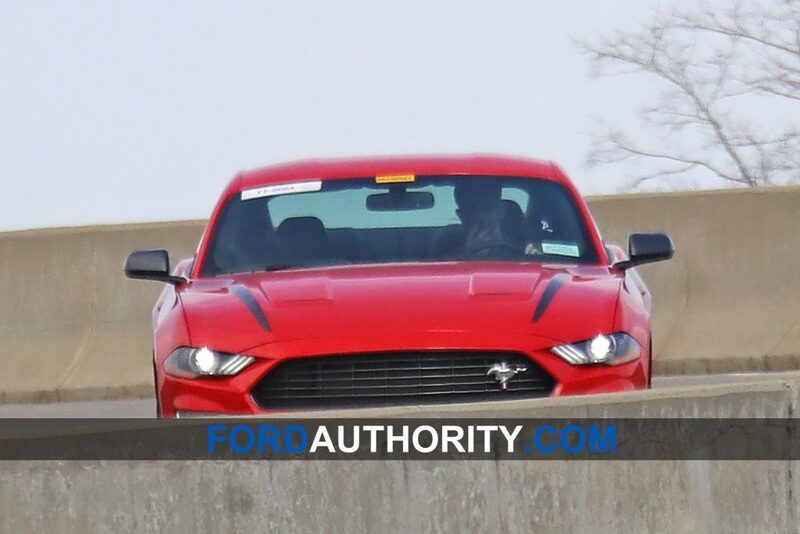 And today, our photographers captured pictures of a Mustang prototype that could very well be the Mustang SVO. All of these features are already available on the Mustang in some capacity, but it’s the other elements that make this model somewhat curious. First, the wheels: from the looks of it, these are 19-inch units, but we don’t believe they are available on the 2019 Mustang at the time of this writing. Then there are unique black hood stripes and black mirror caps, neither of which are currently offered (not even with the Black Appearance Package). 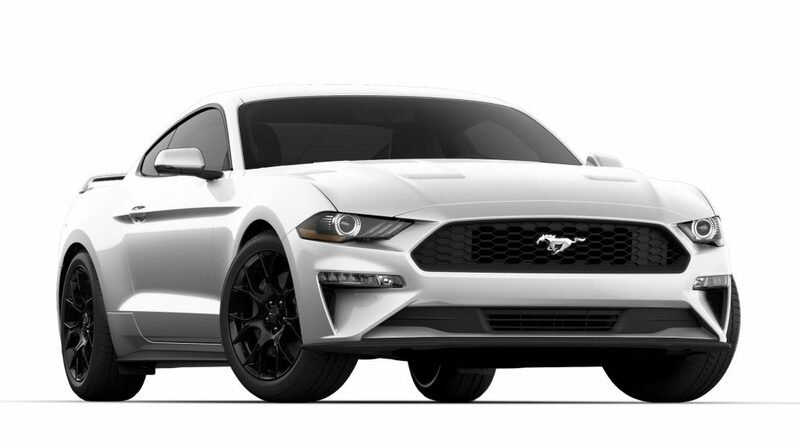 Then, there are the unique front grilles with the offset Tri-Bar Pony logo from the California Special, neither of which is offered on the Mustang EcoBoost. But if all that isn’t enough to pique your curiosity, then we present two more data points. Not only is this Mustang running with covered badges on the front fenders and on the rear decklid, but we’ve only seen engineers test it on the track (as opposed to on the street). 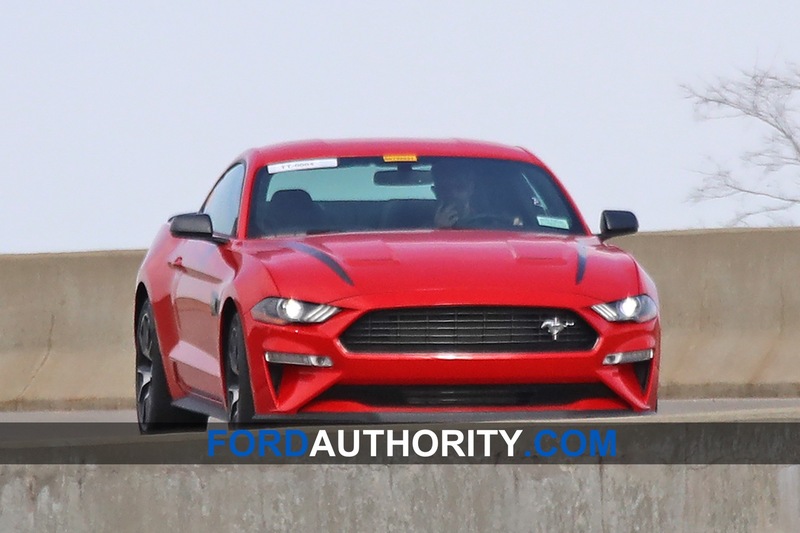 This leads us to believe that we are looking at a prototype of the upcoming Mustang SVO, or whatever name the entry-level, high-performance Mustang model will take on (perhaps Mustang ST). It also makes available quad exhaust tips with active valves and MagneRide. Regardless of whether or not the red prototype in question is the upcoming Mustang SVO, we are certain that such a model is on the way. Question is, what would it deliver? 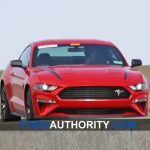 We believe that a Mustang SVO will bring upgrades in track-focused performance and handling, potentially by making MagneRide suspension standard, along with bigger brakes, wider tires, and higher-capacity cooling – things that would take the Mustang EcoBoost beyond the performance envelope of the current model with the aforementioned Performance Package. A higher-output version of the 2.3L EcoBoost I-4; the current 2.3L EcoBoost offers 310 horsepower and 350 pound-feet of torque. 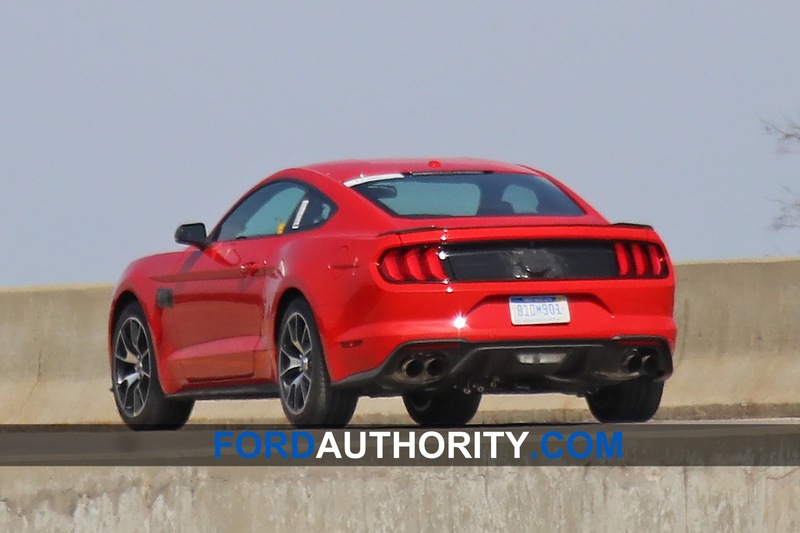 There is also a sizable gap in price and power between the Mustang EcoBoost and GT. The former starts at $26,395 and makes 310 horsepower while the latter commands at least $35,355 and is rated at 460 horsepower. A mid-level Mustang variant to start around $30,000 with roughly 350 horsepower could be just what the doctor ordered. 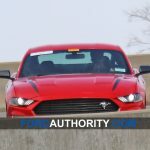 Finally, we should also note that, even though we’ve been referring to this model as the Mustang SVO, there is a possibility that it will end up being called Mustang ST. No matter the name, expect it for the 2020 model year, likely revealed at the upcoming New York Auto show later this month. Subscribe to Ford Authority for more Mustang news and around-the-clock Ford news coverage. This should offer the 2.7 V6 Turbo, cause the gap is to big between the 2.3 4cyl. & the 5.0 V8. Chev in their “crap” Camaro still offer a V6. Crap Camaro? Is that why it has won every comparison test against the Mustang, and also against much more expensive and formidable vehicles? Now, I am a proud Mustang owner… but do show the Camaro the respect it deserves. The only reason we are even getting a Mustang SVO/ST is because Chevy made a Camaro 2.0T 1LE, and it is really, really good. So give Chevy/Camaro credit where credit is due, rather than mindlessly bashing a good product that’s making Ford step up its game. Keep Living in your own little “day tripper” corner Robb, if that’s where it feels good. Hmm so. Anyone/anywhere can go to any auto-website anyhow Greg. Yeah Yeah. What ever I’m sure. You can get Active Exhaust and Magnaride suspension in the EB Performance Package. A turbo V6 would be pretty cool. Looking forward to this one. 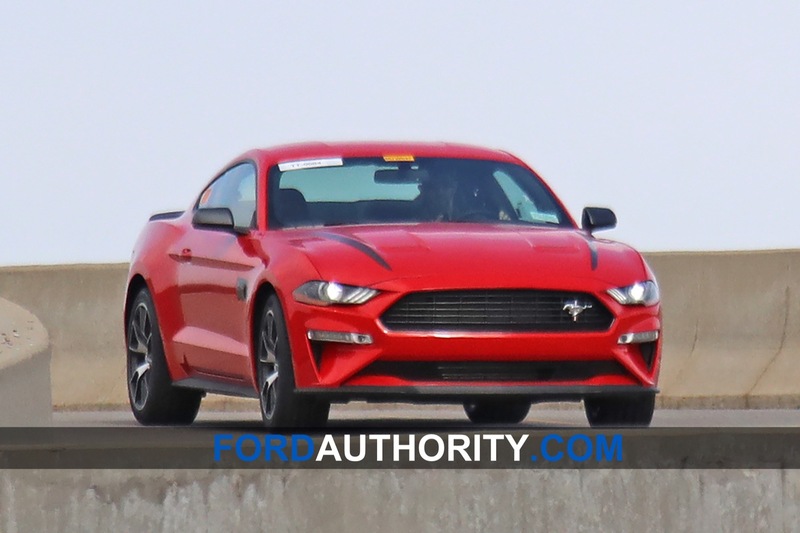 The SVO or whatever it’s going to be called gives Ford another Mustang to offer at a low price point compaired to the GT while offer solid performance. Last last year the Mustang finished on top. Ford sold 75,842 copies. Surprisingly was the decade old Challenger. Dodge sold 66,716 Challengers. Proves big engines and high horsepower in an older chassis car is a formula that for now works. Wonder what happens when FCA moves away from the Hemi to meet EPA regulations. The big horsepower wars are fantastic, but gas gussling cars are not the future of the auto industry making a Mustang “SVO” the perfect vehicle to transition to the EV / Hybrid. A sub $30,000 performance Mustang with 300+ hp. Bringing up the rear the Camaro lagged behind its two competitors, selling a mere 50,963 units. Even worse is the fact that this is a 25 percent decrease compared to the previous year. Where does the Camaro deserve credit. Maybe it’s performance is strong, but that has not been reflected in the showrooms. The terrible new Front-end. The continued blind spots. It a car that’s hard to live with daily. Sales numbers reflect that. Considering styling and performance, handling along with it’s lineup (EcoBoost, GT lineup, Shelby GT350/350R and the new GT500). The Mustang is a fantastic choice and only getting better with time. Looks like the only thing left orignial on the exterior of the 50th Anniversary Limited Edition cars is the Wimbledon White Paint and the Multi-layered Quarter Window Glass. Everything else has been used on the Pony Package, Appearance Package, or Performance Package. On the Interior, it is the Seats, Door Panels and Cashmere Stitching that remain different. The TriBar Grille is also available on the Pony Package, although in Chrome, along with Chrome Window Trim, which has migrated to the Bullitt. The Wheels here appear to be the Staggered 9 and 9.5 Inch Anniversary Wheels, although the photo of the rear appears to make them thinner than the fronts. Ford needs to satisfy those of us that don’t need a V8 but refuse to buy a four cylinder Mustang. Build a performance V6 like Chevy’s 1LE V6 Camaro! How about a 6.2 vzersion of the push rod truck motor that will fit anything… per engineer’s comments… in light weight mustang..
Start a whole new segment.. push rod motor against push rod motor. Hmmm sounds like old days. Best place for a “push-rod” motor is to push it out-of-the-way back to the 1950’s, where it belongs. First things first, I like Richard Zapala’s 6.2L Pushrod idea, and I do agree with Robb that yeah, give Chevy the respect due. 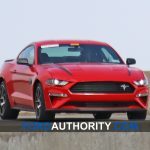 Now as far as this new entry level performance Mustang and my thoughts, comments and Ideas on what it could be/should be/what I like to see. I’m figuring this will probably be the 350hp/350tq variant of the 2.3L Ecoboost, nothing to special. Quite honestly, I would actually love to see a 3.5L Ecoboost V6 mustang. Of all of the Ecoboost engines out there, this engine has been extremely versatile and can be modified to the moon and back. Using similar block technology from what they’ve done with the GT350 & GT500, the can take this engine, give it about 420hp/430lb-ft of torque, a quad tip active exhaust with an exhaust sound similar to that of the Ford GT (I know it’s not going to be the same, different material, shorter exhaust on the GT due to the rear mount of the engine, material, etc. ), the same suspension as the GT PP2, Brembo brakes, 20×9.5″ wheels wrapped in 275/35R20 tires, 10-speed auto, GT350 rear differential and axle setup, unique ST body work with a functional scooped hood (matte black), front spoiler, aero rockers, a more aggressive rear diffuser, a taller lip spoiler (something more 13-14 GT500 like), black grille with the red ST badges, ST fender and trunk badges, an ST interior (like the Focus ST actually, the ST Recaro seats were nicer than the Mustang ones IMO, so was the steering wheel), B&O stereo system (even though I’d prefer a Rockford Fosgate system with amplified speakers and subwoofers and a 12″ infotainment screen) 12″ digital dash, etc. I would also like to see Ford Performance offer a few Mountune/Ford Performance upgrades for this car such as intercoolers, intercooler piping, blow off valves, wastegates, intakes, exhaust upgrades, ECM programing, suspension upgrades, etc. 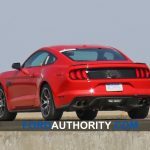 I’d also like to see ford offer optional tail lamp designs for the Mustang (like what GM does with the Camaro/Corvette. 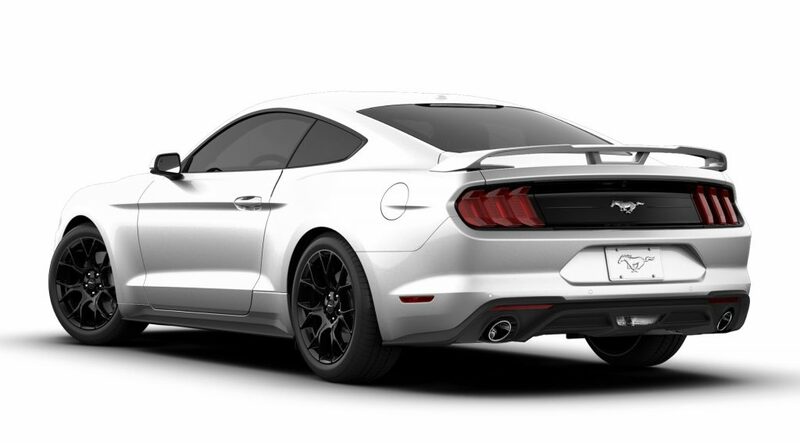 The design of the mustang’s tail lamps are cool but something with more of a black and red housing would be really nice. While this does give the car somewhat of a tuner aspect (being that it’s a twin turbo V6) it would offer an awesome alternative to the GT and if it’s priced between the Ecoboost and the GT It would work. Besides, we all know that in the next few years, the V8 is going away and twin turbo V6 engine will be what replaces them. So With the 3.5L V6 already being in the current chassis, Ford can move the new lineup to a 650hp 3.5L Ecoboost Cobra, a 450hp/510tq 3.5L Ecoboost GT, a 450hp/600tq 3.0L Hybrid and a 350hp/350tq Ecoboost 2.3L. The larger BMW 8-series sized car (I know they compared it to the Challenger but the 8-series is roughly the same and has a closer appearance to the mustang), will have AWD, 10-speed auto & 7speed DCT and other creature comforts and will still be a better performer than any of the current mustangs to date. This is kind of a side note but Ford truly could have saved their car lineup by actually offering cars that people would have been a little happier to own. Granted it wouldn’t have been a Charger, but a Fusion on the S550 Chassis with a 10-speed auto, AWD, with options of a 252hp 2.0L Ecoboost base variant, 350hp/350tq 2.3L ST, a 3.0L 400hp/400tq RS variant, a 450hp/510tq 3.5L Ecoboost V6 GT Variant, and a 450hp/600tq 3.0L Hybrid V6, optional 7-speed DCT, Focus RS derived performance AWD, a better interior with a mustang inspired dash layout, 12″ LCD instrument cluster, 12″ infotainment receiver, sportier interior w/ Recaro options, B&O stereo system, better wheel options, Brembo brakes, dual mode quad tipped exhaust and a few other things, the Fusion would have been the perfect sedan. It would have had better performance (in just about every category) over the Camry or the Altima and if ford gave it proper styling, it would have taken a lot of sales from not only the Camry & Altima, but the Maxima, the Accord, the Malibu, the Regal and more than likely a small percentage of Charger sales (mostly V6 sales and maybe some of the R/T sales but I doubt it would have stolen much thunder from the R/T or anything above that). The Explorer should also have a GT model above the new ST with a 450hp/510tq 3.5 Ecoboost with the 10-speed auto set up for the street. While it has less than the 470hp of the Durango SRT, it has way more torque and lighter weight. Truthfully I would prefer a 480hp 5.0L V8 but like I said before, the V8 will be gone in a few years unfortunately. Biplane rear spoiler or GTFO. What scares me is that there is so much potential here for Ford to make a really good non-V8 non GT mustang here but seeing the track history of Ford, i fear they’re going to something so disappointing here. Just like i worry about with the Bronco, the next gen ranger, the next gen F150 and pretty much everything Ford is about to do in the next few years. It pisses me off because they have so many great pieces and they never put them together to make a full idea. Honestly, some days I wish i could walk into the Dearborn or Detroit office and say “Here, do this. don’t do that, scrap that, build this, put this in it, sit back and sell millions!” Ford should be the #1 car company in the world but they keep missing the mark because some right lane bean counter has to step in and say “womp womp womp womp” Sometimes, I wish Ford would say “Forget the bean counters for about five years and lets hear from our enthusiast & customers and build what the people want! Maybe if we do that, we will have more money, we won’t have to loose money in the chinese market. Maybe we can open more factories in the United States (start by reopening the one in Chester, PA), maybe we can rebuild the market in Australia with global cars (performance, non performance and trucks), etc. Sorry, I get carried away on my comments but I have so many ideas when it comes to Ford. Getting confused on if or when there will be a refresh for the 2021 model. Having difficulty imagining a challenger sized mustang. Looking forward to renderings if either however. from what ive been reading, the 2021 mustang is going to get new sheet metal and other various upgrades but still be on the S550 chassis. The new CD6 S650 mustang is not due till 2026 or so. As far as sizing, I’m thinking more along the lines of the BMW M850i, which is similar to the Challenger in size but based on the concept for displayed, I’m thinking more along the lines of the BMW. same here. I’m trying to hold off at wait to see what Ford does with the mustang. hoping they don’t screw it up. Truth be told, I wouldn’t mind a V6 Ecoboost mustang with hopefully some good styling upgrades and decent performance. I found a video clip of a Ford GT with the 3.5L Ecoboost V6 with a custom borla exhaust on it and there was nothing wrong with it. Exactly. I don’t want them to rush to production and have quality and fit issues while they focus exclusively on whatever direction the 2026 will take. I’m crossing fingers and saving for 2021. Thx for keeping in touch.